Working hard from 9 to 5 or simply living life in a busy city can make you want to relax and get away. 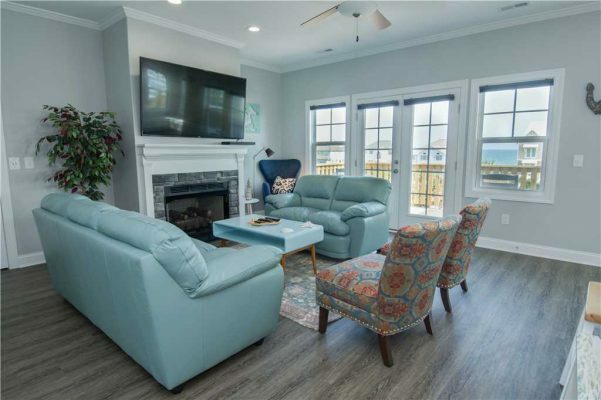 What better way than to kick your feet up, take in the ocean air and enjoy some time away from the everyday. 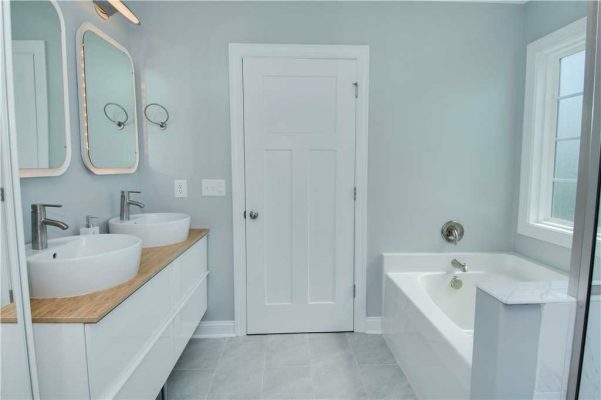 So, it’s safe to say, we’ve nailed it with this vacation rental! 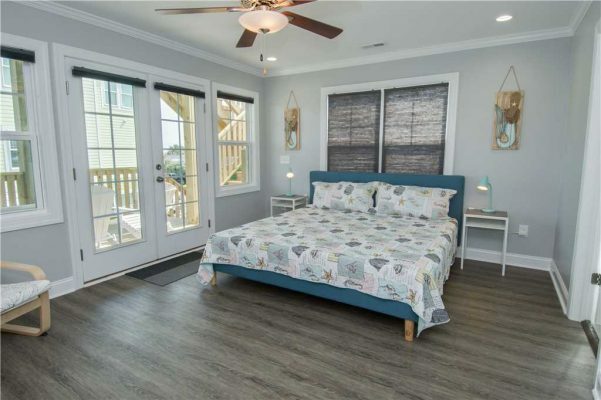 With six bedrooms and five-and-a-half bathrooms, there’s enough room to accommodate your friend’s retreat or family getaway at this week’s featured property, Nailed It. 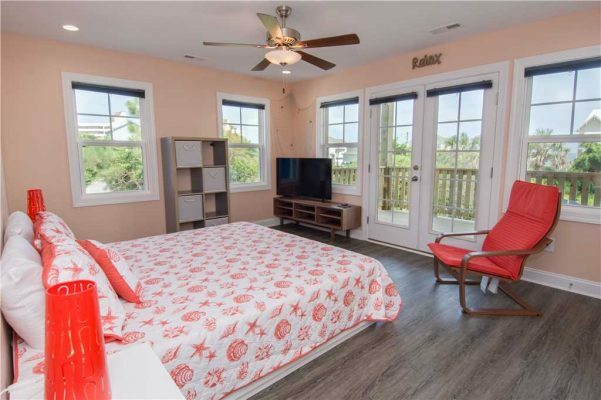 This platinum-rated middle row cottage is jam-packed with amenities including a pool, game room, home theater and easy access to the beach that is just a short walk away from the cottage. Just built in 2018, Nailed It has three stories of space that will ensure your group is comfortable, both at night and during the day. 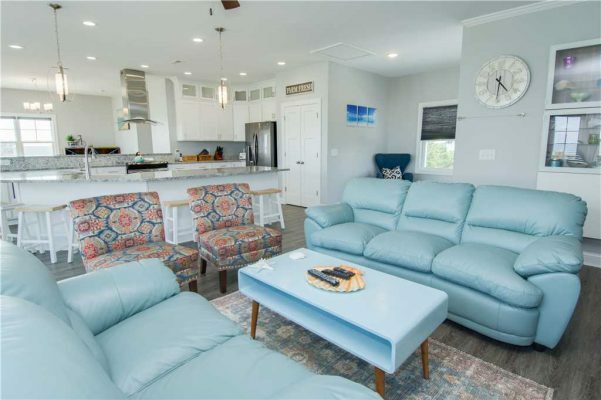 The reverse floor plan puts Crystal Coast views on display from the third-floor common area, and with tall ceilings, this area feels open and inviting. Light blue couches and accent chairs add a pop of color to the living room area that includes a large mounted HDTV. Off of the living room is direct access to the third-floor open patio. There’s no shortage of seating on the third floor as well. 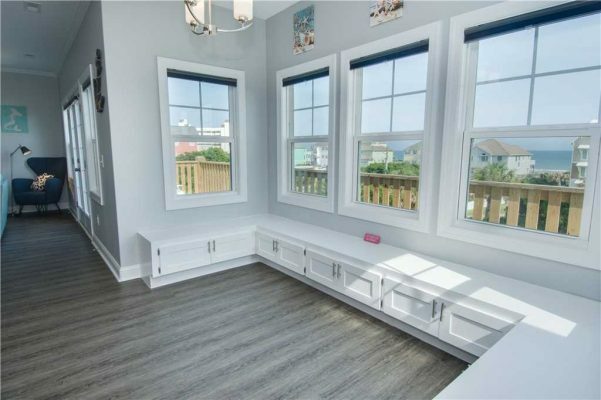 A built-in horseshoe style bench seat is perfect for congregating and has stunning views from the sweeping windows. 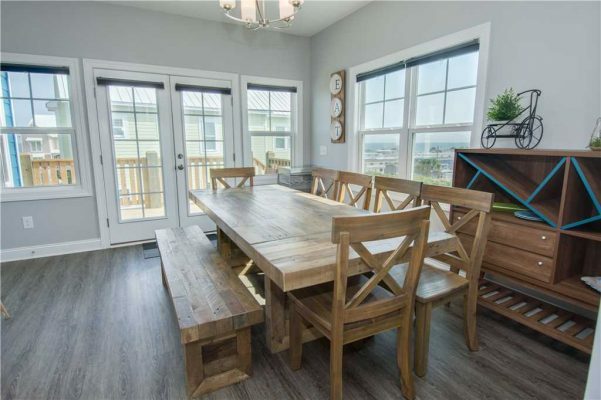 With seating for eight, the dining room table is perfect for meals together. 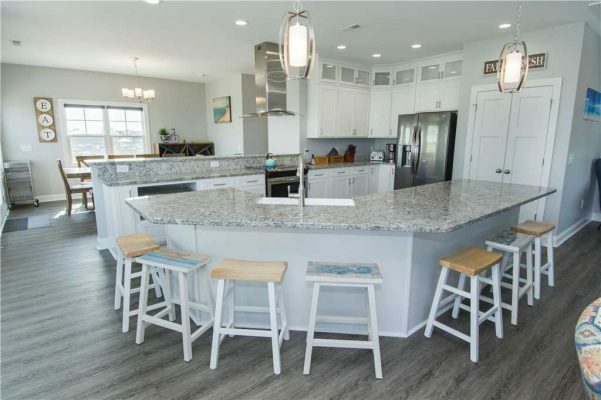 A bar off of the dining room area has five more barstools and a counter-height island in the kitchen has an additional seven stools. 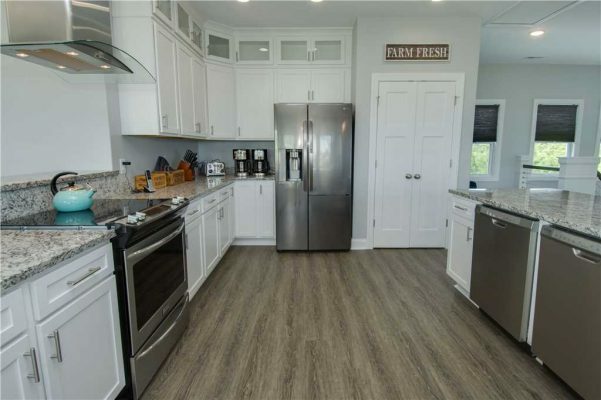 The kitchen is large, modern and features plenty of granite countertop space as well as new stainless-steel appliances. Your inner chef will jump for joy when you see the professional range and a deep farm-style sink will make meal prep simple and the clean-up even easier. 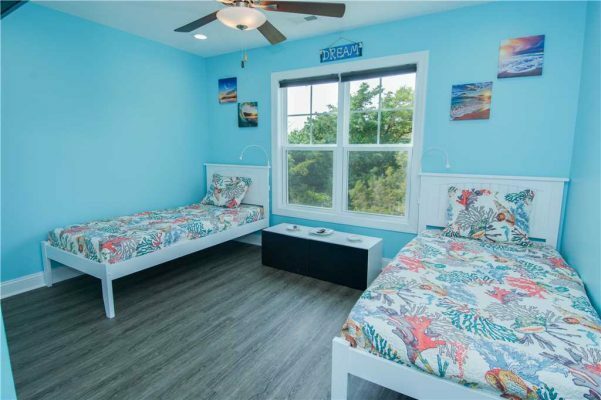 Three king-size beds, one queen size, two twin-sized beds, and two sets of built-in twin size bunk beds make up the huge six bedrooms at Nailed It. 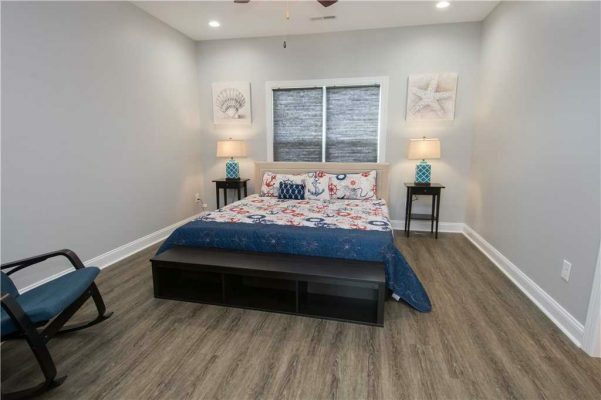 There are three master bedroom suites, each with king size beds that are decorated nicely with plenty of natural light, tall ceilings and red and blue nautical décor. Two of the master bedroom suites have access to the deck through French doors and each suite provides its own spa-like private bathroom. 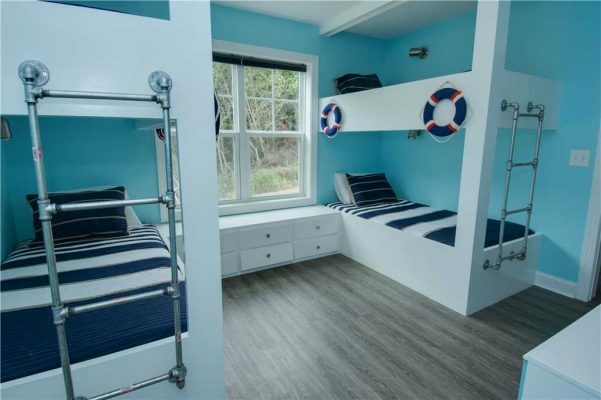 A ground floor bunk room with built-in twin size bunk beds is perfect for younger guests and features nautical hardware like reading lamps and bunk ladders. Another bedroom has two twin-size beds and is spacious and perfect if you’re traveling with a group. The last bedroom has a queen-size bed. 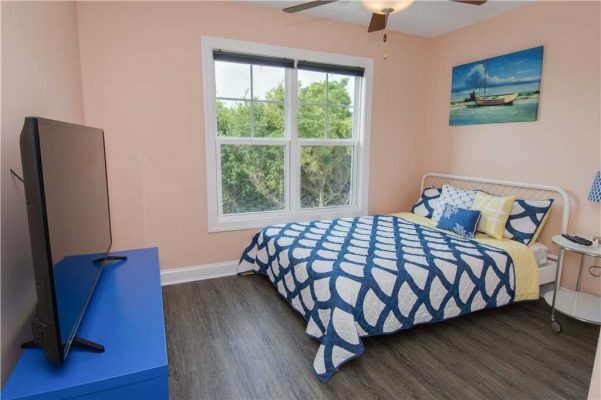 Each bedroom has beautiful hardwood floors and is personalized with calming colors to help you relax. The bedrooms and master suites also have flat screen HDTVs that are great for catching a movie in bed. Nailed It will beg you to stay and not to leave as it features several amenities that sets it apart from many other forms of accommodation. 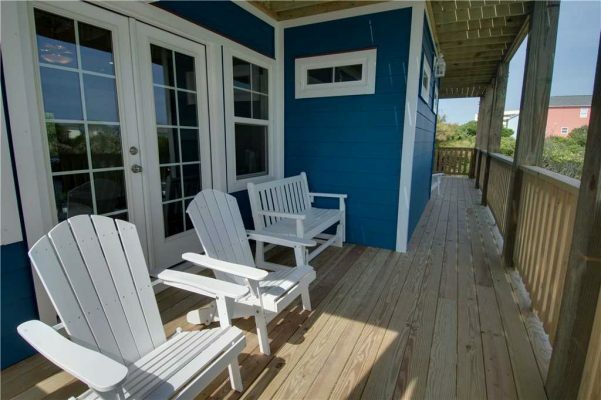 Being a middle row cottage, Nailed It places you very close to beach access and exceptional sweeping views, which can be enjoyed from two levels of decks. 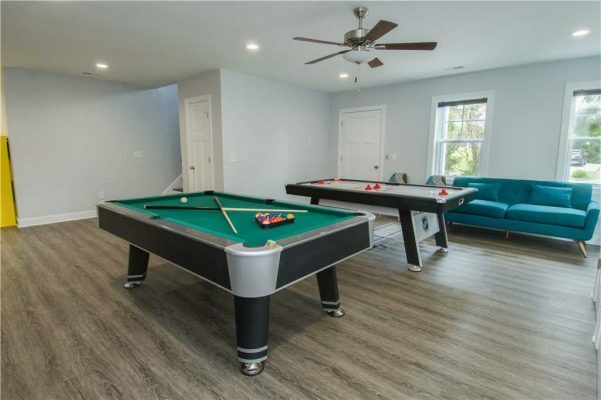 On the ground floor, you’ll find a pool table and foosball table that are ready to go as well as an arcade-like basketball free throw game. This place is great for the kids or those who are a little more competitive. 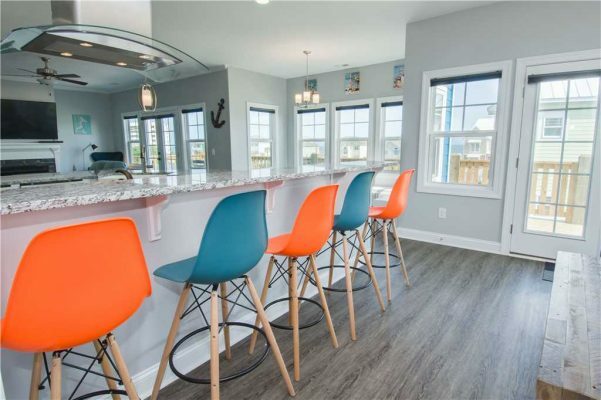 A wet bar is also available with a mini-fridge so enjoying your favorite beverages is easy and convenient. 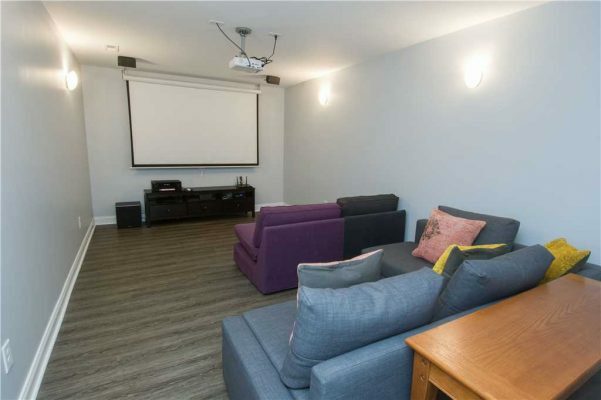 The ground floor also provides a special surprise with its very own theatre room, complete with comfortable lounging furniture for the ultimate movie night. The HD theater-quality projector and booming surround sound system will make movies that much better. 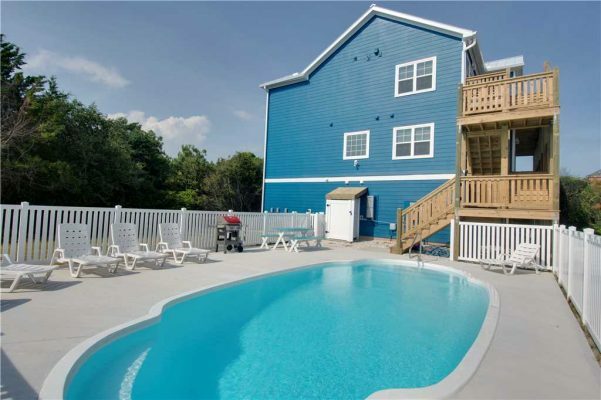 Outside, off of the ground floor, is Nailed It’s long and refreshing pool that is ready for guests to take a dip. Chaise lounges are also available around the swimming area to relax and catch some rays.  You will also find a gas grill and picnic table for putting together the ultimate poolside cookout. The best part is that everything is private with rows of foliage on either side of the property. Other important amenities include two sets of front-loading washers and dryers, an elevator that services all three floors, cable television and Sand Club Linen Service, so beds are made upon arrival. 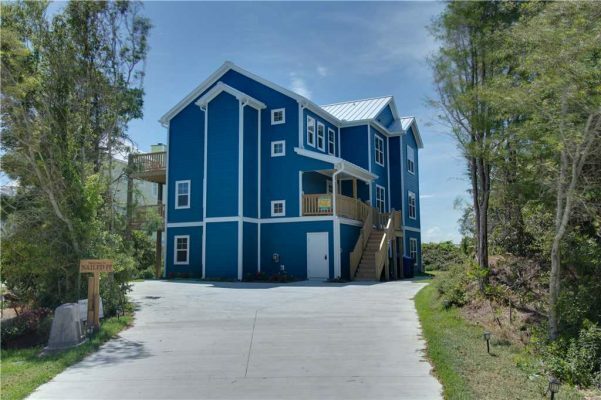 Don’t miss out on this newly constructed cottage and the many features it has to offer! Nailed It is available all year round and available to book on a weekly basis. 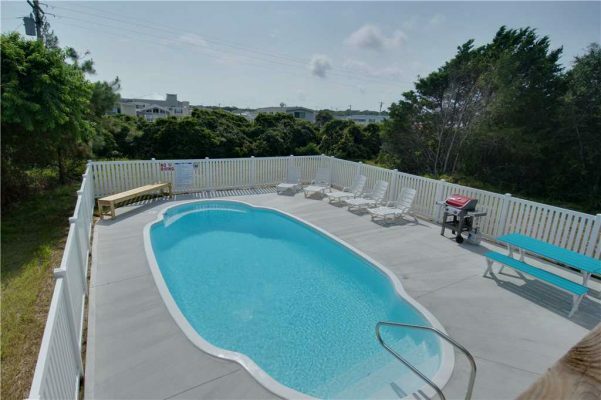 Be sure to check out more photos of Nailed It and find the perfect availability for your next Emerald Isle vacation!